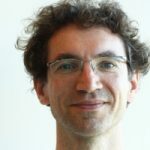 Marco Roos performs biosemantics and e-science research at the Human Genetics department of Leiden University Medical Centre (LUMC) and the Informatics Institute of the Faculty of Science of the University of Amsterdam in the Netherlands. In Leiden he coordinates the biosemantics activities, which are mainly focused on applying emerging methods within this collaboration. Marco's original background is biology (molecular cytology), but his speciality is interdisciplinary research. His research is on investigating and developing information technologies to enhance biological research (e-science). This currently pertains to the workflow paradigm to enhance computational analysis of biological data, and Semantic Web languages and tools to capture and use biological knowledge in computer supported analyses.